In her speech, which was about the future of the EU, Merkel said: ‘What is really important, if we look at the developments of the past year, is that we have to work on a vision of one day creating a real, true European army. She said the new army would work in conjunction with NATO, but added that ‘only a stronger Europe is going to defend Europe.’ ‘Europe must take our fate into our own hands if we want to protect our community,’ she said. The remark drew widespread applause and a smattering of boos from watching lawmakers. A RUSSIAN attack on the Yellowstone supervolcano with “hyper-calibre” nuclear weapons are “guaranteed to destroy” the United States, according to a military expert. Russia should abandon the idea of creating conventional ground forces capable of defeating NATO and “occupying Europe”, Sivkov Konstantin vice president of the Russian National Geopolitical Academy, has said. Instead, Russia should focus on making nuclear war “irrational” and “meaningless” for the US by looking for an “asymmetrical answer”, Konstantin wrote in an article for VPK News. Because Russia cannot compare with the US in the nuclear race, he argued, finding another a solution that plays to its strengths “remains the only way out”. He suggested Russia should capitalise on its technological superiority to create “hypercalibre nuclear munitions” loaded with the equivalent of 100 megatonnes of TNT. To put that into context, the atomic bomb dropped on Hiroshima during World War Two exploded with the energy of about 15 kilotonnes of TNT – a fraction of the warheads proposed by Konstantin. The most powerful nuclear weapon ever detonated, tested by the USSR in 1961, yielded an estimated 50 megatonnes and may have reached 100 megatonnes in its “final form”. Konstantin argues that Russia needs to produce “40–50 such warheads for heavy ICBMs or ultra-long torpedoes” to ensure mutually assured destruction, known as MAD, in the event of a nuclear war with the US. He cited Yellowstone supervolcano and the San Andreas Fault Line as pressure points that are “critically dangerous for geophysical conditions in the United States”. “Such attacks are guaranteed to destroy both the USA as a state and the entire transnational elite,” he wrote. His terrifying assessment comes amid US threats to unilaterally withdraw from the Intermediate-Range Nuclear Forces (INF) Treaty, signed in 1987 during the Cold War. Trump threatened to pull out of a treaty eliminating some nuclear missiles, including Pershing missiles, due to what he said was Russian non-compliance. Labour MP Fabian Hamilton said Trump’s “dangerous” threat would “unilaterally withdraw” the USA from a global system of trust the country had been at the forefront of “painstakingly” building, leaving European allies exposed. “In 1987 it was Europe at the epicentre of the Cold War and the arms race between America and Russia,” he said. “Withdrawal from the INF brings back the spectre of Pershing missiles stationed in Europe and here in the UK – something I remember vividly from the 1980s. 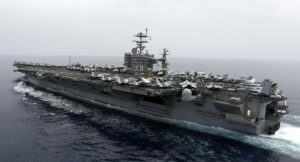 “We stand against Iran’s unsafe even reckless behaviour in the maritime domain like the July attacks on international shipping by Iranian-supplied Houthis in the Bab Al Mandeb,” Mr Mattis said. US President Donald Trump, who in May withdraw the United States from a 2015 international nuclear accord with Tehran, has strongly backed Saudi Arabia in its efforts to counter Iran’s influence. The Russian nuclear arsenal is getting a major boost in spending from the Kremlin. China may be quickly becoming America’s newest “big enemy,” but it won’t replace Russia as Enemy No. 1 of the Deep State and Military-Industrial Complex in the U.S., and tensions are still building between Washington and Moscow. As TruNews reported Thursday, President Vladimir Putin told an audience at a policy conference in Sochi that his country’s hypersonic missiles would be deployed in the “coming months,” potentially allowing Russia to leapfrog both China and the U.S. in terms of nuclear deterrence capability. The U.S. has no means of preventing a strike from a hypersonic attack, which travels at speeds far greater than Mach 5. Of the six advanced weapons systems Putin unveiled earlier this year, two of them will be ready for deployment by 2020, according to military intelligence sources who spoke with NBC News. The report didn’t say which two systems would be ready. The Stockholm International Peace Research Institute notes that Russia is well into its 10-year military modernization program, which began in 2011, and has now turned its attention to its “nuclear triad”—ground, sea, and air-based delivery systems—“dramatically” increasing its funding for nuclear weapons. In 2016, the most recent year for which budget data is available, spending on acquisition and modernization of Russian nukes has increased by 427 percent since 2010. Russia now has the largest nuclear weapons arsenal in the world. It also has some of the most sophisticated aerial defense systems in the world, and has been exporting that technology, most recently to Syria, which has received S-300 systems in the wake of the downing of a Russian surveillance aircraft during airstrikes by Israel. Military sources in Syria are reporting that specialists are now reprogramming the S-300 aerial defense systems delivered there to prepare them for their local mission, which requires replacing Russian codes with those for the Syrian military. But, a gross miscalculation could lead to a military conflict that drags the U.S. and the West into a full-scale war with Russia. Outside of the Israel-U.S.-UK machinations for war with Iran, the leaders of Russia, Turkey, Germany, and France are scheduled to meet in Turkey later this month to discuss a final “political settlement” in Syria that could lead to an end to the seven-year civil war. According to reports, the leaders will exchange a number of views, and will hold “bilateral discussions” on the sidelines of the gathering. Russian officials said “other pressing international issues”—likely a reference to Iran—would also be discussed. Two stealth fighters reportedly flew undetected over Iran, crossing Syria and Lebanon on the way, to conduct surveillance missions on sites believed to be connected to the Iranian nuclear project. According to the report, two IAF F-35 Adir fighter jets entered Iranian airspace last month and conducted reconnaissance flights undetected, crossing Syrian and Iraqi airspace on their way to the Islamic republic. The flyby was intended in preparation for a possible joint Israeli-American attack in Syria, specifically on Iranian outposts, the report said, without confirming whether the operation was undertaken in coordination with the US army. The two planes—which are considered to be among the most advanced in the world—flew at a high altitude over sites suspected for a long time to be connected to the Iranian nuclear project, the report added, noting they were not detected at any moment by radar systems in any of the countries they flew over, including Russian radar systems stationed in Syria. Iran has made no announcement that it spotted such action. Al-Jarida has in the past uncovered a series of security affairs related to Israel, and has even claimed to receive its information directly from the prime minister’s office. This report comes in the wake of Israel’s official admission last week that it was responsible for the 2007 attack on the nuclear reactor in Syria, as well as against the backdrop of mounting tensions with Iran.